You Want Your Pipes to Leave You Alone and Do Their Job Quietly out of Sight! But when something goes wrong, you can be in for a sudden disaster. A problem with your water or sewer lines can lead to everything from bad odor to water flowing where it shouldn’t be. Don’t let an unexpected malfunction cause major damage to your home or building. Matlock Plumbing in Columbus, IN will fix your pipes for you at rates that won’t put a dent on your budget. Don’t Let Your Sewer Cause a Stink in Your Life! A clogged drain can be a major inconvenience. Fortunately, Matlock Plumbing is at your service to offer fast and efficient drain cleaning services you can rely on. Our plumbers are knowledgeable about the most effective methods in treating clogged drains in any area of the home. We will have your drains cleared and flowing well again in no time. Whether you need drain cleaning in your laundry room, kitchen, or bathroom, we can provide you with the right solutions. We will arrive with vans fully stocked to remedy your drain cleaning concerns. We also offer sewer drain cleaning services to keep your sewer system working in the best condition. We utilize advanced equipment and the latest technology for superior results. We know how important it is to have the drains and plumbing systems in your home well-maintained. Our crew makes sure to arrive on-site at your most convenient time always. 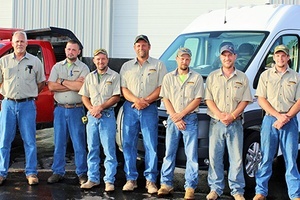 We have been serving the plumbing needs of Seymour and Columbus, IN for many years so you can count on our skills and expertise to get the job done right.